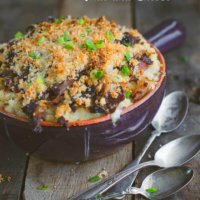 Combine two classic comfort foods together to make this leftover pulled pork mac and cheese with garlic panko, one amazing dinner the whole family will be fighting over! Find more leftover pulled pork recipes here. Since we purchased our Big Steel Keg a few y ears ago, my husband has perfected smoking meats and grilling up delicious barbecue. So much so, that even my dad, who recently moved from Houston to San Diego leaving behind his beloved Texas barbecue, has proclaimed hubby’s smoked brisket and smoked pork roast equally delicious. So, we make a lot of barbecue. I mean, A LOT OF BARBECUE. And a lot of barbecue means a lot of leftovers! It’s not a bad problem to have, don’t get me wrong. Sometimes we freeze our leftover pulled pork and brisket, but many times, I work the leftovers into new recipes, like this leftover pulled pork mac and cheese and the killer garlic panko topping. 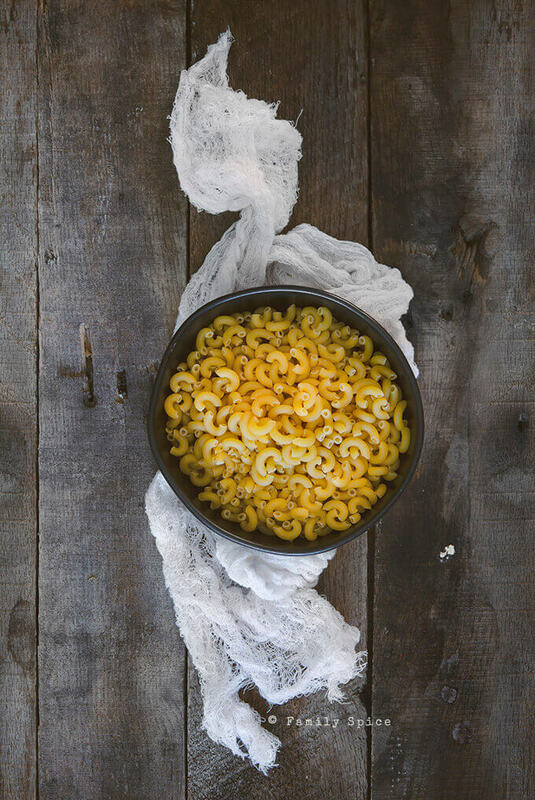 As the name suggests, the iconic elbow macaroni is always a favorite as the base for any macaroni and cheese. 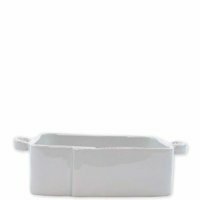 It is short yet sturdy and holds up with the cheesy sauce. Almost any pasta can be used for macaroni and cheese, but I would not use spaghetti, fettuccini or linguine type noodles. Other favorite pastas to use in this leftover pulled pork mac and cheese: small shells, penne, fusilli, farfalle, rotini and ziti. Can pulled pork mac and cheese be made ahead? 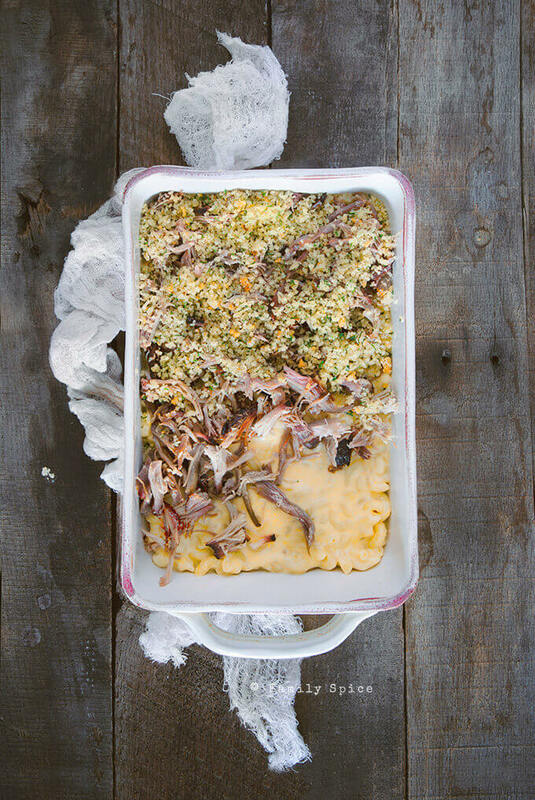 There are several ways you can prepare and serve your pulled pork mac and cheese. The entire dish can be assembled, ready to bake, but cover in foil and refrigerate to be baked later or the next day. Just make sure you are using a dish that can go from refrigerator to oven. You can also bake the entire dish and reheat it later. To reheat your mac and cheese, bake in the oven at 350ºF for 20 minutes until warm and bubbly. Can you freeze your mac and cheese? If you are using the types of pastas I suggested, you can freeze your mac and cheese. But I would not freeze them in a baking dish, but in freezer safe containers. Even better, divide them into individual serving sizes for easy reheating – especially for the always-hungry-teenager. When it comes to mac and cheese, my eldest son considers himself a connoisseur. He loves all kinds of mac and cheese in all of its shapes, sizes and flavors. From boxed to homemade, he’s never met a mac and cheese he didn’t like. When it comes to the type of cheese to use, you can get very creative and use a wide number of cheeses. From the classic sharp cheddar to even brie. You can also combine cheeses to get more flavor. If you do combine cheeses, I suggest mixing a hard cheese with a soft cheese to balance flavor and add more creaminess. 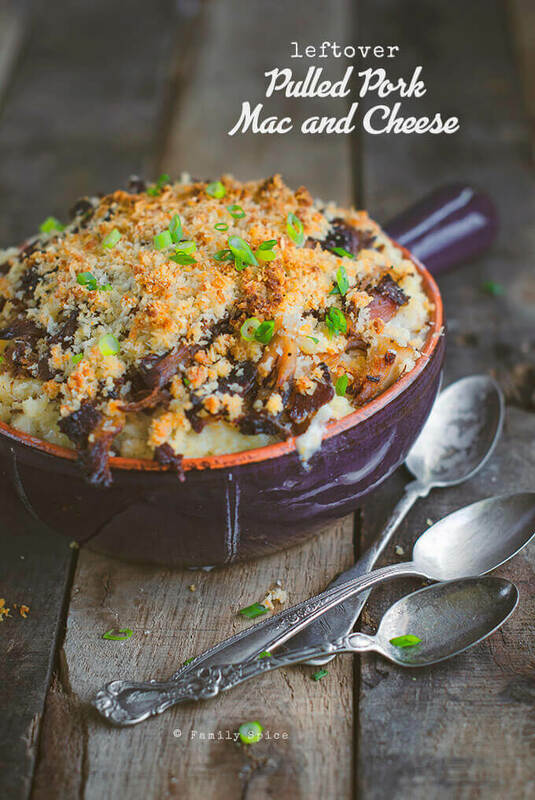 Combine two classic comfort foods together to make this leftover pulled pork mac and cheese, one amazing dinner the whole family will be fighting over! Bring a large pot of water with 1 tsp salt to boil. When water is at a rolling boil, add macaroni. 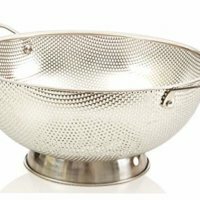 Drain pasta in a colander and reserve. Return pot to the stove and over medium heat add 2 TBS butter with 1 TBS olive oil. When butter is melted stir in crushed garlic and cook until lightly browned. 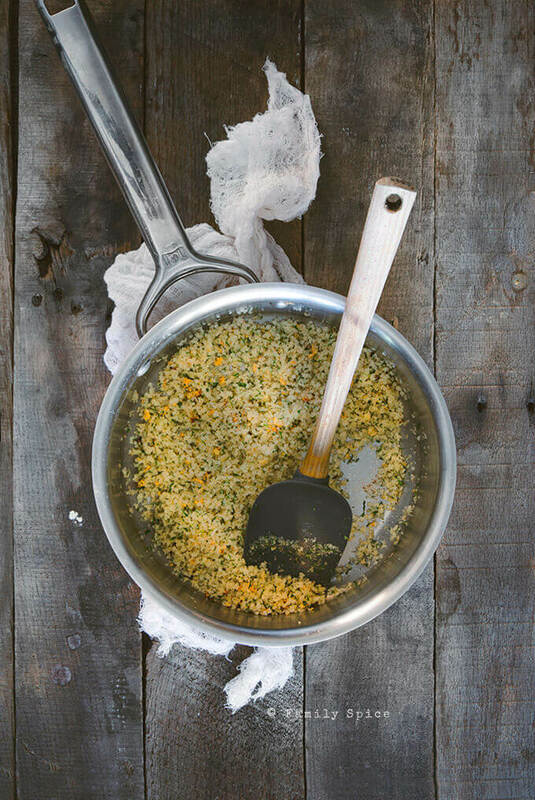 Stir in panko crumbs and dried parsley and cook 1 more minute. 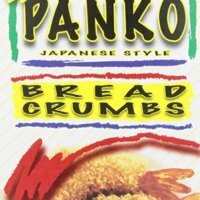 Transfer panko mix to a bowl and reserve. Return pot to the stove and over medium heat melt 1 TBS butter. When butter is melted, stir in flour. Continue stirring and cooking for 1 minute then slowly whisk in milk. Stir in shredded cheese then remove from heat when cheese is completely melted into the cream sauce. Stir in reserved macaroni and mix well. Transfer macaroni into an 8x8 pan. Top macaroni with shredded pulled pork and spread evenly. Spread garlic panko evenly over the pulled pork. 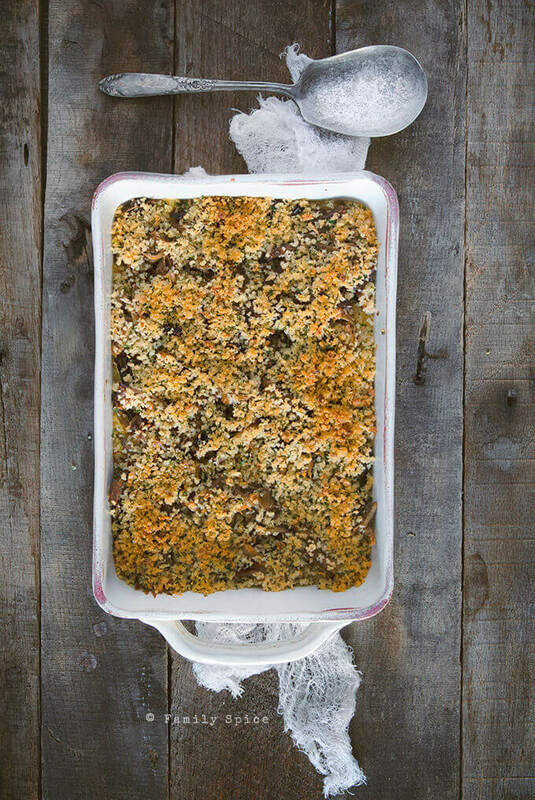 Bake for 20 minutes or until the cheese is melted and bubbly and the breadcrumbs are golden brown. If you don't have or eat pork, you can substitute pulled pork with shredded brisket or chicken. 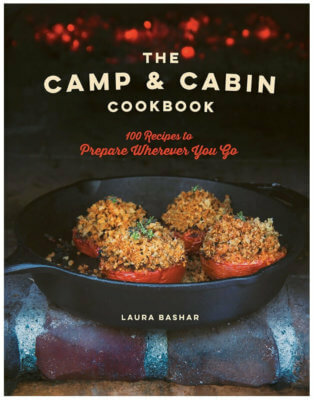 I love this – using the leftover meat and all the ideas for cheeses. With my lactose intolerance, the right choice of cheese is crucial – I love the combo of one hard and one soft and I used lactose free milk! Yum!